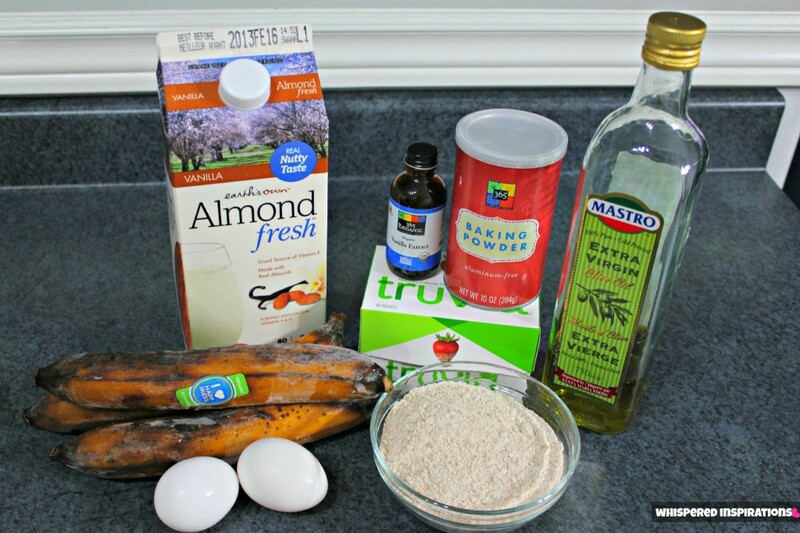 Almond Fresh Moist Banana Bread Recipe! One of the many things that I love doing is baking and since I love doing it pretty often, I like to find healthy ways to make our favorites! We are an almond milk drinking family, if you look in our fridge, you will find vanilla, chocolate and unsweetened almond milk at all times. Anyway, I had that same dilemma we all face from time to time–the dreaded bananas in the freezer. Just a little side note, I’ve stated this recipe is almost organic and I know that some of the ingredients aren’t. Please feel free to alter the recipe to your liking! So, here is an almost organic banana bread that is super nutty and packed with goodness! 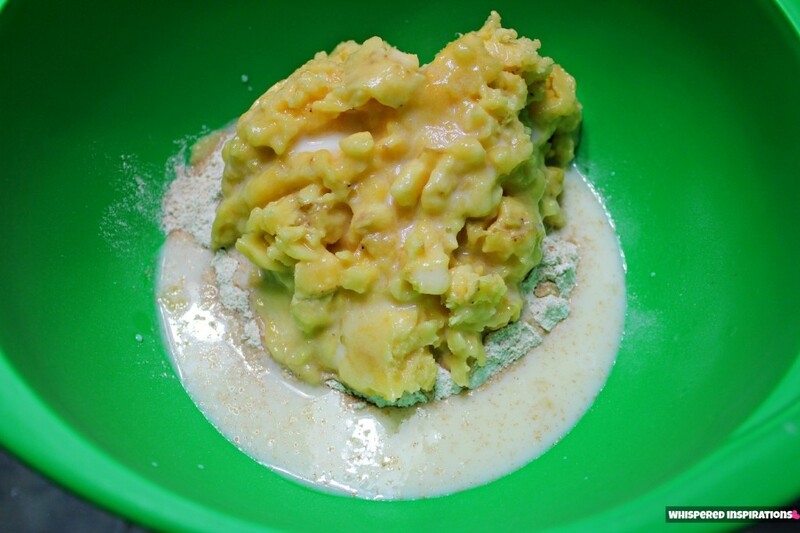 Take the flour, baking powder and stevia and place it in the large mixing bowl and begin to mix thoroughly until all the ingredients are combined fully. Set aside and move onto the next step! 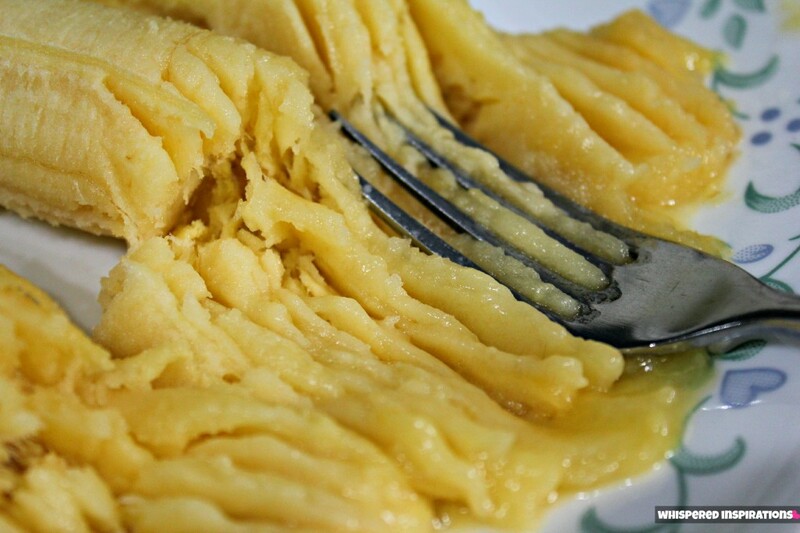 Take your two eggs and break them into the small mixing bowl, whip them lightly and put them aside. Get out your plate and fork! On a separate bowl, begin to squash your bananas with a fork. 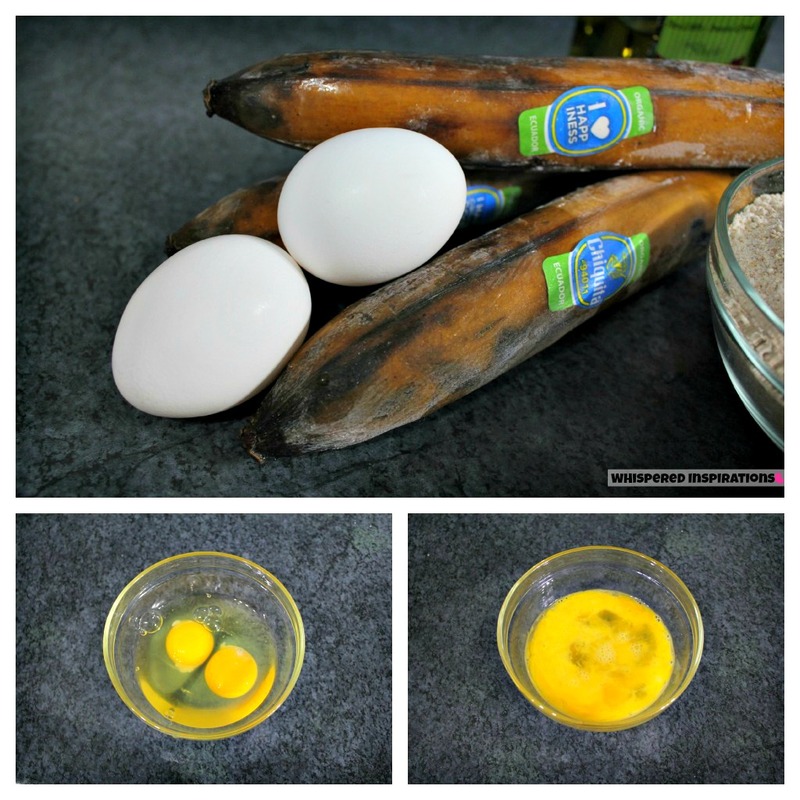 Squash them to your liking, if you want your bread with chunkier banana or to completely be absorbed–it’s your choice! I kept mine a bit chunkier because my family loves it that way! 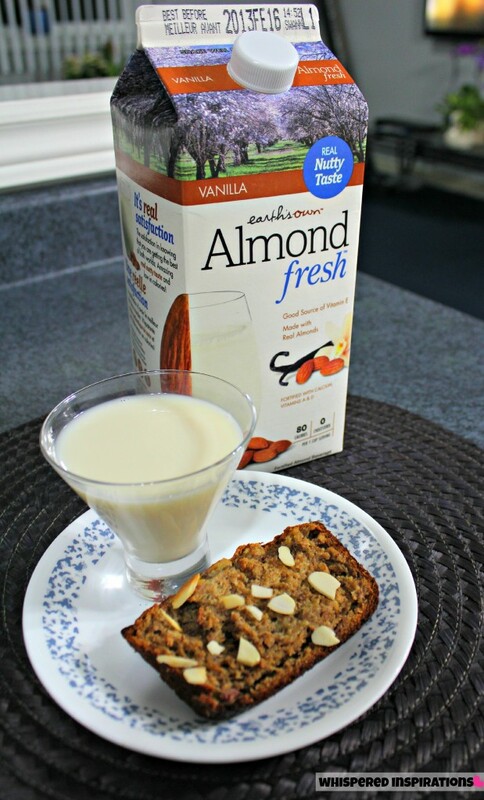 Make it FRESH–With Almond Fresh! 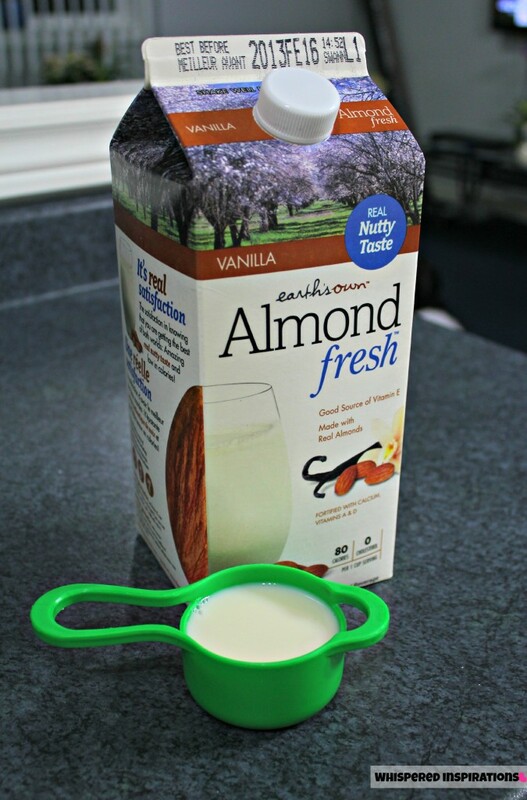 Pour your 1/3 cup of Almond Fresh, I chose Vanilla but, you can use their unsweetened or for a tropical twist, their new Coconut Almond Milk! Add mashed banana and almond milk to your dry mix, begin to mix until combined. 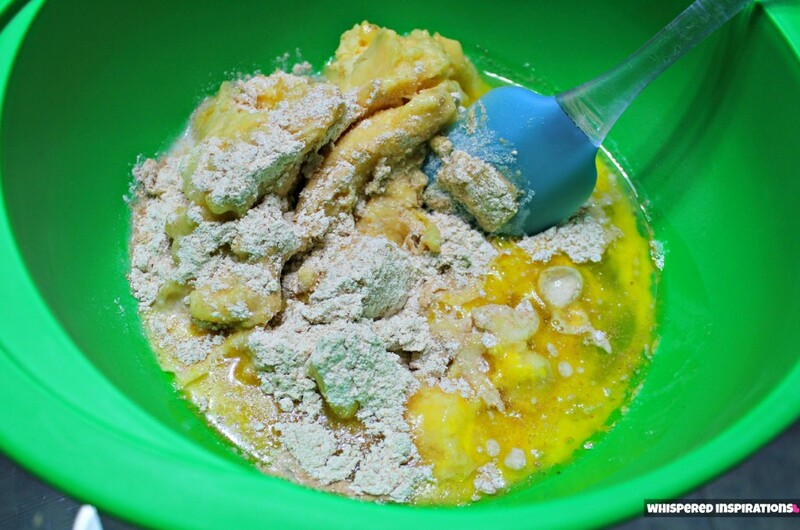 Add the oil, vanilla and egg mixture into the batter and begin folding until the batter is completely mixed. I usually do this by hand and it turns out great! Coat your loaf pan with butter, margarine or spray so that it doesn’t stick. Pour in the finished batter and place the loaf in the middle of the oven tray. Set oven at 325 degrees. It should cook for about an hour and until the center is fully cooked and the top is browned. You can test it by poking the center with a toothpick. To add the slivered almonds, wait until the loaf is nearly cooked. I also added a line of fresh bananas at this time to decorate the loaf. Pair It with a Cup of Almond Fresh and Enjoy! Wait until loaf is completely cooled before your remove it or cut into it, once cooled–take a slice and pair it with a cup of delicious almond milk. That’s what I did and it was unbelievably delicious. By replacing dairy in the recipe, I added Calcium and Vitamin D which play an essential role in bone health. Most importantly, the vitamin E found in almonds (alpha-tocophenol) is the most easily absorbed antioxidant known. It protects cells from oxidation by removing free radicals, which contribute to aging. It’s also cholesterol-free and low in fat, which makes for a delicious, light and nutty banana bread! For more information and to see the newest flavors and recipes from Almond Fresh, visit them on their website or “like” them on Facebook for great updates, here. 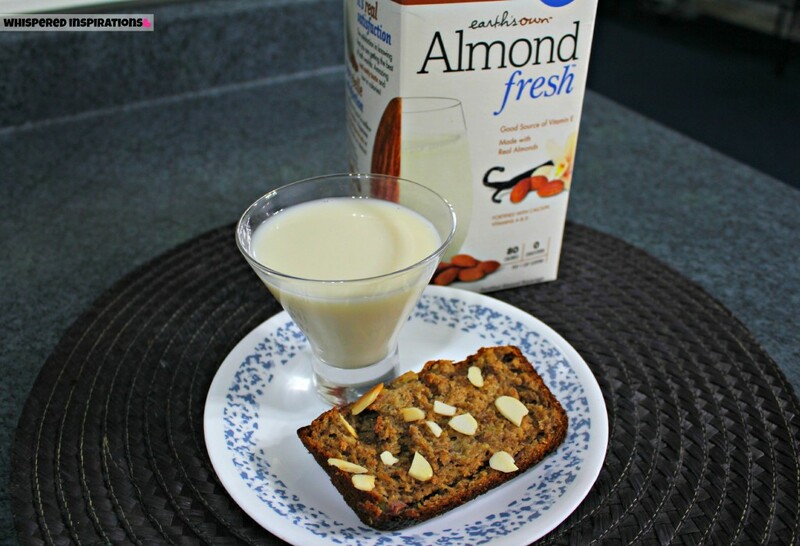 Have you ever replaced dairy with almond milk in your recipes? 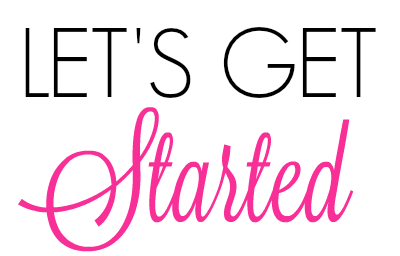 Previous Post: « Flipsize.ca: Simple Way to Buy, Sell, Swap Kids Clothes! Enter to Win $100 Flipsize Gift Certificate! What a delicious recipe! I LOVE Almond Fresh but have never baked with it, so thank you for sharing the recipe. My family is nuts for banana bread! My recent post Disney Valentines – Printable! Wreck-It Ralph &amp; Disney on Ice! Banana bread is so yummy, this gave it a nutty twist. I use almond milk and coconut milk in muffins myself. Love it! 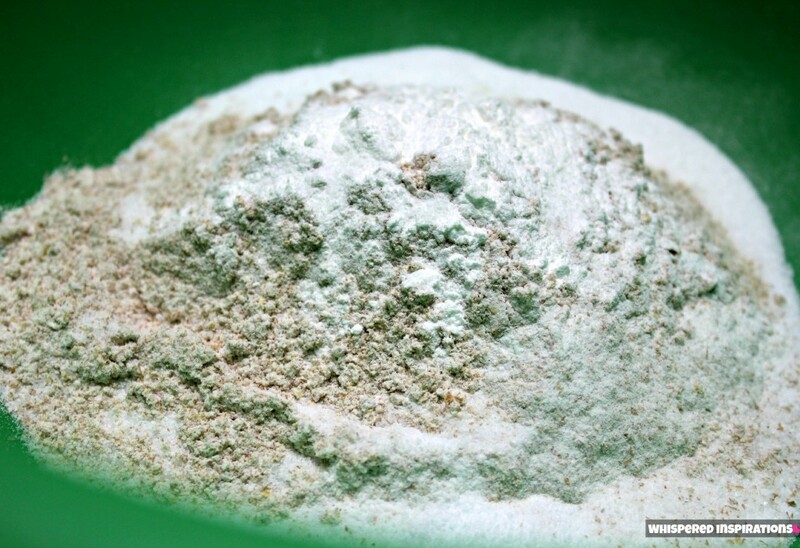 I`ve also started experimenting with spelt and kamut flours as a lower gluten alternative to wheat. It`s great finding ways to make favourite recipes a little healthier, isn`t it? Thank-you so much, it sure is. That's very interesting to bake with and coconut milk is delish as well. Yum! That looks delicious. I love banana bread! Almond milk is my favorite. I put it on (and in) everything. What an exiting new twist to a classic recipe. Great job, Nancy. You've inspired me to make some banana bread over the weekend. My recent post Go ahead and express yourself with Chooze! 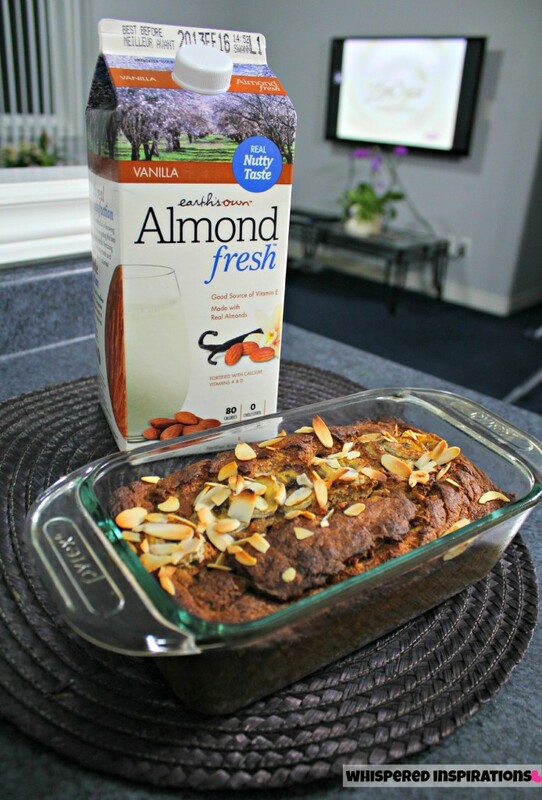 Your banana bread made with Almond Fresh looks delicious! Love the nuts sprinkled on top! My recent post Skyfall Blu-Ray Review! I love banana bread. I have not tried Almond milk before…. OMGosh! That looks incredible! YUM! LOVE this recipe! Looks amazing. Plus, Truvia is amazing. I always keep some of that in my home! So very true, I love almonds and eat them or DRINK them everyday! this sounds delish! I've been wondering what to make with my almond milk – this is perfect! We all love Banada bread, but I haven't made it since we discovered almond milk! Thanks for your recipe, we are going to make this soon! We do use almond milk in our baked oatmeal! We all love Banana bread, but I haven't made it since we discovered almond milk! Thanks for your recipe, we are going to make this soon! We do use almond milk in our baked oatmeal! I haven't made banana bread in ages! I like the idea of using almond milk instead of cows milk. Thanks! I love making banana bread, and always replace the dairy with soy. Haven't tried almond milk yet, but I think I will!! It\’s really yummy, gives it a nutty taste. I definitely will! Thanks for the recipe! Wow, I love banana bread, this looks so delicious!!! It is delish, give it a try. Yummy! I can't wait to try this recipe. I've come across quite a few recipes using Earth's own almond milk, and it seems to work very well. Must try your recipe, it really looks yummy! Just saw this recipe. Definitely a keeper. Healthy too. I like your additions of almonds and banana along the top. Thanks for sharing! I love banana bread and I’ve got 2 recipes that I love but I love how your recipe has almond milk. This is a healthier version, for sure.